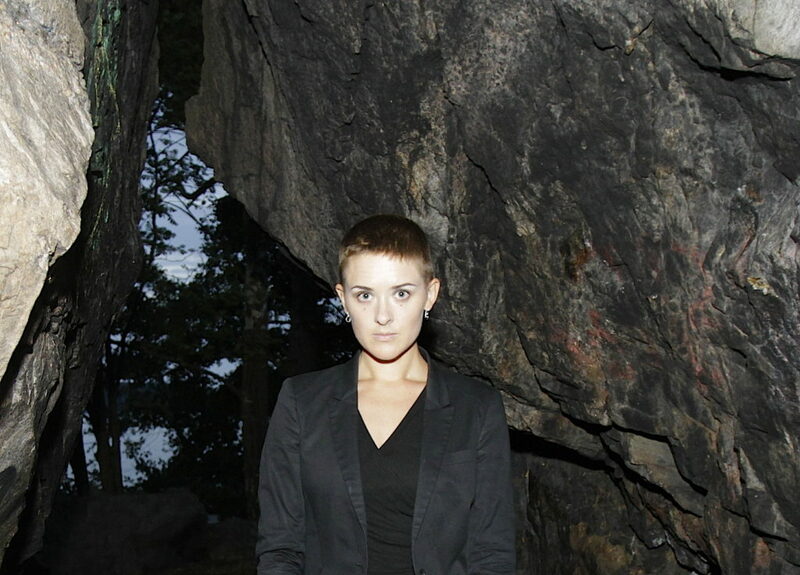 Maria W Horn is a composer hailing from the north of Sweden, based in Stockholm since 2011. Maria W Horn is interested in the manipulation of time and space through sonic extremes – oscillating between minimalist structures and piercing power electronics utilizing both digital and analog synthesis as well as acoustic instruments and audiovisual components. Her work examines aspects of human perception – how audiovisuality and overload/loss of perceptual stimuli can conspire to transcend everyday life and invoke alternate mental states. She is a part of Sthlm Drone Society – an association working to promote slow and gradually evolving timbral music, and co-operates the label XKatedral. On your latest album, Kontrapoetik, you delve into your past. Can you describe the area that you grew up in and in what way did it influence you (also artistically). I grew up in the north west of sweden, the province is called Ångermanland. Just by the coast towards the Gulf of Bothnia there is a small town with around 17000 inhabitants, called Härnösand. It is a beautiful place with light summers and dark winters, but in terms of culture me and my peers felt deprived. We grew up with a strong narrative: in order to become someone, to accomplish anything, we need to leave this place. So for the next ten years I tried to integrate myself in the capital cities of Stockholm and Berlin, where the supposedly “real” culture happens. But a commission from the local museum in Härnösnad, to make music based on archival material, made me return and take new interest in my home region. If you scratch the surface there are several historical narratives that defines this area.Except being the site of Sweden’s largest documented execution of women accused of witchcraft, Ångermanland used to be a blooming sawmill district and the Swedish workers movement was particularly strong here. The nickname “Röda Ådalen” (The red Ådalen), has been washed away by the tourist industry and replaced by “The High Coast” a name that refers to post-glacial rebound and land rises, a phenomenon first recognised and studied there. This process of research personally turned into what can be likened to a reversed exorcism of the area, a way of exposing historic traumas in order to gain a better understanding of its past and present. Thereby it helped me reconnect and recognize the area as more complex and interesting than what I thought growing up there. Artistically, I believe that the comparable isolation and cultural scarcity of my home region has definitely shaped my artistic direction. If you want anything to happen in a small town like this, you have to organize it yourself. Playing in bands and working collectively for a scene to exist was therefore key. To this day I think this kind of mentality stuck with me – the importance of collectivity. There are various narratives that you explore on the album. Apart from Ångermanland, there’s also themes of patriarchy, feminism, spirituality. You were also part of an artistic research project in the form of a satanic feminist sect whose goal was to “develop a practice consisting of ceremonies and rituals based on counter readings of the Christian genesis narratives, dismantling its misogynist traditions.” Can you talk about this? We formed a group in order to explore the potential of separatism and sectarianism as an artistic method. Our initial idea was to gather material for some kind of a stage performance, but as our practice developed we decided that a closed practice was the ideal format. I don’t want to go into detail regarding our practice in the sect, but validation of anger is one main topic, as well as counter readings of mythological and religious texts and myths such as the genesis narrative. The symbol of Satan as an allie to people that has historically been condemned, burned or seen as other / outside the ideals and standards of society. As I researched my home area at the same time as I was part of this group, it heavily influenced the music on Kontrapoetik, some of the music is even composed with our ceremonial practices in mind. How do you compose/structure your music? On the album, you also recontextualised field recordings, harmonically it was inspired by Swedish pastoral music. The compositions are expansive, there’s also a sense of history embedded in them as well, something from a different time, inherently dark (in a way we view Middle Ages as a dark period, superficially). As the methods and compositional environments often turn out to be very defining of the musical outcome, I am trying not to get stuck with one or a few ways of working, but instead make use of a palette of different technologies. Usually one composition contains material generated with several different tools, then processed and reamped through several others. I used to be more of a purist in that I did not want to use sounds that refer to things outside the music itself, I guess it follows an old formalist idea that extra-musical elements and narratives is distracting of the music itself. But in Kontrapoetik I included a lot of these kinds of sounds, like gongs and field recordings and church organs, which in some sense was a new way of working for me. To compose harmonic material I like using a piano keyboard or some kind of generative patch where I can easily try out different tunings. For synthesis I am a fan of using the musical programming environment SuperCollider, as it enables me to work with synthesis from scratch. If I want to work with rhythmic structures I would most likely use a live coding sequencer program called Tidal Cycles. For mixing and mastering I would use Logic Pro or Reaper. In Kontrapoetik I worked a lot with re-amping, as well as processing trough tape machines, and I think these techniques added a sense of history, along with the use of archival material and samplings. What is the importance of psychoacoustics in your work? I am interested in how human consciousness responds to sensory information, particularly in sound and vision.When I compose I am often trying to find points where controlled compositional methods such as minimalist and formalist approaches can be contrasted with chaotic elements such as feedback or chance operations. I have had personal experiences where slowly changing music enabled me to enter another kind of listening, or when loudness and physicality would cause an altered state of perception. In my live sets I am trying to combine contradictory modes of expression, to use dynamics and contrast as a way to tickle sensory responses, or in various ways explore the boundaries, the physical limitations on how we perceive sound. Can you talk about the Sthlm Drone Society – an association working to promote slow and gradually evolving timbral music that you’re part of? When I moved to Stockholm around ten years ago to study electroacoustic composition I met some people interested in generative music, digital synthesis and musical minimalism. We formed Sthlm Drone Society as a kind of support network and interest group, and have among other things organized 12-hour drone events in industrial buildings around Stockholm, creating immersive environments suitable to present this type of slowly evolving music. Can you talk about your musical influences? You’ve recently made a mixtape of Swedish folk and black metal. I do listen to a lot of different kinds of music, and through my youth I went through a variety of subcultural phases, from playing in punk bands, to being a metal kid to being really into Swedish folk music and so on, these musics affects me still today, perhaps even more than “current” musical releases. When I was fifteen I was part of a folk rock music band with five other girls, and this might have been the most defining period in my life in terms of musical collaboration and the kind of friendships and feeling of “us against the world” that we experienced. Every weekend we visited another god-forsaken corner of north Sweden, and we completely glorified the era of seventies progressional folk-rock with bands such as Kebnekaise, Norrlåtar, Hedningarna and Hoven Droven. As for more recent influences I gain a lot of musical inspiration from the friends and colleagues I have around me in Stockholm, as well as the small but interesting musical scene we have here. The Drömfakulteten crew organizes the most explosive parties and in terms of dance music they are all such wizard queens. Norberg Festival is a highlight of the year and continues to present innovative lineups, along with underground initiatives such as Masskultur and Country Music. The music presented at Fylkingen, from quirky free-improv to Fluxus experiments and text-sound compositions from the sixties also shaped me a lot through the years.